Despite their paramount importance for stimulation of new research in avian systematics, the often-cited DNA-DNA hybridization studies of Sibley and Ahlquist (1990) have proven to be an unreliable basis for phylogenetic inferences (Harshman 2007). The higher-level phylogeny of neornithine birds remains incompletely understood, but some consensus has been reached in recent phylogenetic analyses, and provides a framework for an interpretation of fossil taxa (Cracraft et al. 2004; Ericson et al. 2006; Mayr 2008b; Hackett et al. 2008). Results of molecular analyses are particularly convincing, if clades are congru-ently obtained by analyses of independent data, such as nuclear and mitochondrial DNA, or gene sequences on different chromosomes. However, although molecular analyses are an important tool for the reconstruction of the higher-level phylogeny of birds, only a phylogeny which is based on morphological characters allows the assignment of fossil taxa. There have been some attempts to analyze the higher-level phylogeny of extant birds with large morphological data sets (e.g., Mayr and Clarke 2003; Livezey and Zusi 2007). Concerning several major clades, the results of these analyses are, however, not in concordance with well-supported clades obtained in studies of molecular data. As detailed elsewhere (Mayr 2008b), such large-scale analyses of equally weighted morphological characters run the risk that many simple homo-plastic characters overrate fewer ones of greater phylogenetic significance. Analyses of smaller sets of well-defined characters may thus be a more appropriate approach in the case of morphological data. As a basis for the phylogenetic assignment of fossil taxa, identification of morphological apomorphies is further needed for many clades. Figure 3.1 shows the cladogram which serves as a phylogenetic framework for the present study. This tree summarizes clades which were congruently obtained by two molecular analyses of different gene sequences, i.e., combined sequences of the c-myc exon 3, RAG-1 exon, myoglobin intron 2, and ornithine decarboxylase introns 6 and 7 with the intercepting exon 7, as well as the P-fibrinogen intron 7 (see Figs. ESM-4, ESM-6 in Ericson et al. 2006; Mayr 2008b). 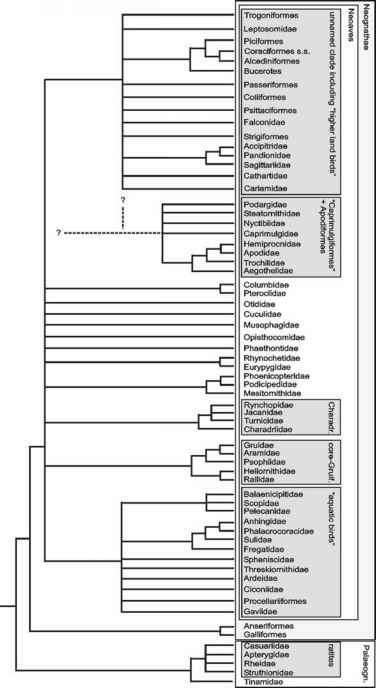 All of these clades were also recovered in a recent analysis of Hackett et al. (2008), and several can be supported with derived morphological characters. In the following some of the major clades are briefly discussed. There is consensus among most systematists that neornithine birds can be divided into the sister taxa Palaeognathae and Neognathae (Cracraft et al. 2004; Harshman 2007; Livezey and Zusi 2007). Presumably apomorphic features of palaeognathous birds are, among others, the lack of fusion between the maxillar process of the nasal bone and the maxillary bone, as well as the presence of a pair of furrows on the ventral surface of the mandibular symphysis, whose dorsal surface further is flat. Neognathous birds exhibit an intrapterygoidal joint, which develops in early ontogeny and allows a greater mobility of the palate; in addition, there is a conjoint auditory tube (tuba auditiva communis) and the ilioischiadic foramina of the pelvis are caudally closed. Within Neognathae, Galloanseres, i.e., a clade formed by Galliformes (landfowl) and Anseriformes (waterfowl), is the sister group of the remaining taxa, the Neoaves. The latter share a derived reduction of the phallus and associated structures, which independently occurred in some Tinamidae and Galliformes (Livezey and Zusi 2007; Montgomerie and Briskie 2007; Mayr 2008b; Brennan et al. 2008). The phylogeny within Neoaves is only poorly resolved, and many of the traditional (e.g., sensu Wetmore 1960) higher-level taxa have been shown to be nonmonophyletic. Prime examples therefore are the "Pelecaniformes" (pelicans and allies), "Ciconiiformes" (storks and allies), "Gruiformes" (cranes and allies), "Caprimulgiformes" (nightjars and allies), and "Coraciiformes" (rollers and allies). The "Pelecaniformes" were long considered to be well established, because the representatives share a number of derived features that are not found in other birds, such as totipalmate feet and a gular pouch. In current analyses, however, only a clade including the Fregatidae (frigatebirds) and Suloidea [Sulidae (gannets and boobies), Phalacrocoracidae (cormorants), and Anhingidae (anhingas)] is congruently obtained. The Pelecanidae (pelicans) belong to a clade that also includes the Balaenicipitidae (shoebill) and Scopidae (hamerkop), i.e., taxa that were traditionally assigned to the "Ciconiiformes." The position of the Phaethontidae (tropicbirds), which were assigned to the "Pelecaniformes" by earlier authors, is uncertain (Cracraft et al. 2004; Fain and Houde 2004; Ericson et al. 2006; Harshman 2007; Mayr 2008b; Hackett et al. 2008). The traditional "Gruiformes" encompass various groups of superficially rail- or crane-like birds. Monophyly of a taxon including these birds has never been well established and current analyses only support monophyly of the "core-Gruiformes," i.e., a clade including the Rallidae (rails), Heliornithidae (finfoots), Psophiidae (trumpeters), Aramidae (limpkin), and Gruidae (cranes). The affinities of most other gruiform taxa are still subject to debate, although there is consensus that the Eurypygidae (sunbittern) are the sister taxon of the Rhynochetidae (kagu) (Cracraft et al. 2004; Ericson et al. 2006; Fain et al. 2007; Harshman 2007; Mayr 2008b; Hackett et al. 2008). As shown by various molecular analyses of both mitochondrial and nuclear gene sequences, the Turnicidae (buttonquails), quail-like birds of open habitats of the Old World, which were traditionally also classified into the "Gruiformes," are aberrant representatives of the Charadriiformes (shorebirds and allies; Paton et al. 2003; Paton and Baker 2006; Fain and Houde 2007). The "Caprimulgiformes" include five extant taxa of crepuscular or nocturnal birds: the Steatornithidae (oilbird), Podargidae (frogmouths), Caprimulgidae (nightjars), Nyctibiidae (potoos), and Aegothelidae (owlet-nightjars). There is now congruent support for a clade including these birds and the Apodiformes (swifts and hummingbirds). The "Caprimulgiformes" are, however, paraphyletic, and the Aegothelidae are the sister taxon of the Apodiformes (Mayr 2002b, 2008b; Mayr et al. 2003; Ericson et al. 2006; Hackett et al. 2008). The phylogenetic affinities of the Leptosomidae (courol) are unresolved, but the taxon clearly does not belong to the "Coraciiformes" (Mayr 2008b, c). Analyses of nuclear gene sequences also congruently support paraphyly of the remaining "Coraciiformes" with respect to the Piciformes (woodpeckers and allies; Mayr et al. 2003; Fain and Houde 2004; see Fig. 27.4 in Cracraft et al. 2004; Ericson et al. 2006; Hackett et al. 2008). Concerning the "Falconiformes" (diurnal birds of prey), there is congruent molecular evidence for a clade including the Sagittariidae (secretary bird), Pandionidae (osprey), and Accipitridae (hawks and allies), which also share a derived syrinx morphology. The affinities of the Cathartidae (New World vultures) are less certain, but some molecular analyses indicate sister group relationship to the clade (Sagittariidae + (Pandionidae + Accipitridae)). 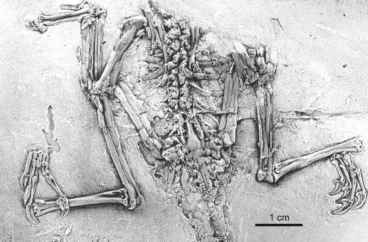 The position of the Falconidae (falcons) is unresolved (Griffiths 1994; Cracraft et al. 2004; Ericson et al. 2006; Mayr 2008b; Brown et al. 2008; Hackett et al. 2008). There are few strongly supported clades within Neoaves, but one of these is certainly that including the Podicipediformes (grebes) and Phoenicopteriformes (flamingos), which is obtained in virtually all molecular analyses including these two taxa (van Tuinen et al. 2001; Cracraft et al. 2004; Ericson et al. 2006; Harshman 2007; Brown et al. 2008; Hackett et al. 2008). Although grebes and flamingos are quite different in external morphology, they share a number of derived morphological characters, including the presence of 11 primaries (except for the Ciconiidae all other avian taxa have ten or fewer primaries), nail-like ungual phalanges, and a chalky layer of amorphous calcium phosphate on the eggshell (Mayr 2004a; Manegold 2006). Phoenicopteriformes and Podicipediformes are further parasitized by an exclusively shared taxon of cestodes (Amabiliidae), and their phthirapteran feather lice are closely related (Mayr 2004a; Johnson et al. 2006). The closest extant relatives of the flamingo/grebe clade are unknown. Whereas nuclear gene sequences indicate a possible sister group relationship to the Madagascan Mesitornithidae (mesites; Mayr 2008b), a study based upon mitochondrial sequences suggests a sister group relationship to the Charadriiformes (MorganRichards et al. 2008; Mesitornithidae were not included in that analysis). Fain and Houde (2004) suggested an early dichotomy within Neoaves into two lineages called "Metaves" and "Coronaves," with "Metaves" including the Columbiformes (doves and sandgrouse), Phoenicopteriformes, Podicipediformes, Mesitornithidae, Rhynochetidae, Eurypygidae, Opisthocomidae (hoatzin), Phaethontidae, Apodiformes, and the nonmonophyletic "Caprimulgiformes." However, a "metavian" clade has so far only been obtained in analyses including P-fibrinogen sequences (see also Morgan-Richards et al. 2008; Hackett et al. 2008). Whereas individual "metavian" taxa share derived characters with representatives of the "Coronaves," there exist no morphological apomorphies, which support a clade including such exceedingly different groups as hummingbirds, flamingos, and the hoatzin. Fain and Houde's (2004) assumption that the presence of a nota-rium is such a character was erroneous, as apodiform birds, Phaethontidae, and most "Caprimulgiformes" lack this feature, which instead occurs in some "Coronaves," e.g., the Gruidae, Threskiornithidae (ibises), and Falconidae. Molecular analyses support a clade including various aquatic or semiaquatic taxa, i.e., Gaviiformes (loons), Procellariiformes (tubenoses), Sphenisciformes (penguins), the nonmonophyletic "Pelecaniformes" except Phaethontidae, as well as the taxa of the nonmonophyletic "Ciconiiformes." This clade resulted from analyses of combined sequences of four nuclear genes (see Fig. ESM-6 in Ericson et al. 2006), a further large-scale study of nuclear DNA (Hackett et al. 2008), and is also supported by analyses of whole mitochondrial genome sequences (Gibb et al. 2007; Morgan-Richards et al. 2008; Slack et al. 2006). A "waterbird clade," albeit with a somewhat different composition, was assumed by earlier authors (e.g., Olson 1985). A similar clade was obtained in an analysis of morphological characters by Livezey and Zusi (2007), but also included the Phoenicopteriformes and Podicipediformes in the analysis of these authors. Most authors regarded penguins as closely related to either the Procellariiformes or the Gaviiformes. The morphological evidence for either hypothesis is, however, weak and penguins share several derived characters with representatives of the clade (Fregatidae + Suloidea) which are absent in the Gaviiformes and Procellariiformes (Mayr 2005b). Most notable among these are greatly reduced external narial openings, opisthocoelous thoracic vertebrae, a very large patella which bears a marked furrow/canal for the tendon of the ambiens muscle (absent in the Fregatidae), a single-lobed nasal gland with only a single efferent duct, a very short tarsometatarsus, and a layer of amorphous calcium carbonate which covers the eggshell. The young of penguins, Fregatidae, and Suloidea are further fed down the gullet of the adults. Although penguins lack a totipalmate foot, this feature appears to have evolved several times independently. In addition to the Fregatidae and Suloidea, it is also present in the Pelecanidae and Phaethontidae. Moreover, because the hallux of extant Sphenisciformes is greatly reduced, the possibility cannot be excluded that their stem lineage representatives had totipalmate feet. Molecular analyses do not show congruent results concerning the affinities of penguins (Sibley and Ahlquist 1990; van Tuinen et al. 2001; Cracraft et al. 2004; Watanabe et al. 2006). Sister group relationship to the clade (Fregatidae + Suloidea) resulted from an analysis of nuclear gene sequences by Fain and Houde (2004). Mitochondrial sequences support a clade including the Fregatidae, Suloidea, Spheniscidae, and Phaethontidae (Brown et al. 2008), whereas Hackett et al. 's (2008) analysis of nuclear gene sequences resulted in a sister group relationship between the Sphenisciformes and the Procellariiformes. Earlier authors assumed that various extant birds whose hindlimbs lack the ambiens muscle are closely related, and a group including these birds was informally termed "higher land birds" by Olson (1985). In its usual composition, this assemblage includes the Strigiformes (owls), Coliiformes (mousebirds), Trogoniformes (trogons), Piciformes, Passeriformes (passerines), Apodiformes, "Caprimulgiformes," and "Coraciiformes" (Olson 1985; Mayr et al. 2003). Molecular analyses do not support a clade including these taxa, but the two analyses that form the basis of the cladogram in Fig. 3.1 congruently obtained a clade including the "higher land birds," as well as the "Falconiformes," Psittaciformes (parrots), and, certainly most unexpectedly, the Cariamidae (seriemas), which were traditionally assigned to the "Gruiformes." At present, this clade, which also resulted from the analysis of Hackett et al. (2008), cannot be characterized with morphological apomorphies.